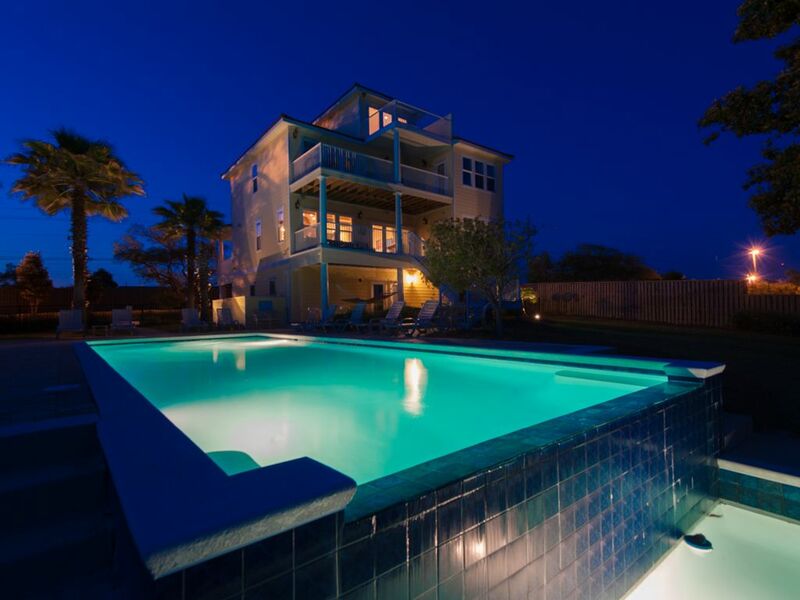 Amazing Navarre Getaway with Views, Great Amenities! Spring dates avl! Please note: We are unable to accommodate weddings, receptions, or events. If you are interested in booking our home for your vacation, please tell us a little about yourself, your rental party, and the reason for your visit. This gorgeous home - the Palm Breeze Beach House - on the Santa Rosa Sound boasts amazing views from numerous porches, balconies, bedrooms, and living area. Watch blue herons trek across the beach looking for dinner and the occasional dolphin that frolics in the calm waters. You can enjoy this poolside next to the infinity-edge pool (POOL IS NOT HEATED) or relax in the above-ground hot tub under the night sky after a day at the beach. Lush tropical landscaping abounds on the property to make you feel like you're truly in an oasis! While the hot tub is private to this home, the pool/beach/dock are shared with the Seahorse Retreat - a similar home we manage that can also be rented together or separately (see listing 177462 on VRBO and 164976 on Homeaway). Each home is on 1/2 acre and enclosed by a fence for privacy. The kitchen has plenty of space to create meals for a large family, or grill out! We also have our own private white sand beach and dock - bring your wave runners! Or, enjoy the tandem kayak on site - it's a great way to explore the Sound. Of course you can head down the road to the family attractions in Destin or let the sugar-white sand sift through your toes just five miles west on uncrowded Navarre Beach, Florida's 'best kept secret.' You may even decide to enjoy your own beach where the water is clear and shallow, and parents can let young children play without concern about rough water or undertow. This home and the one next to it, which sleeps 16, may be available for rental together. Please check calendar; we update it daily. We manage this property for the owners, John and Diane Shim. The location - 5 miles from Navarre Beach and 15 miles from Destin - makes it easy to access both towns, as well as Fort Walton Beach and Pensacola. The water on our beach on the Sound is perfect for swimming because it's shallow and calm, and it's probably one of the best places to try paddle boarding (if guests don't have boards, they can be delivered to the homes). The lovely landscaping, beautiful infinity-edge pool and spas, numerous balconies, and upscale decor make it a great place to relax and enjoy special time with family or friends. Master 1 with full bath and jetted tub. Master 2 with full bath and jetted tub. Queen and kid's room share full bath. Full bath at bottom of spiral stairs for cupola. Ground floor with full bath. Powder room off living area. Linens and bath towels provided. Please bring your own beach towels. Two refrigerators - one in kitchen and one in garage. Ice tea maker and rice cooker. Dining room table seats 5. Large piano bar in kitchen seats 6. Extra table in hall area seats 4. Outside there is a picnic table and an additional table. Home is on 1/2 acre and is beautifully landscaped. There are three balconies - one off first-floor family room and master bedroom, which has porch furniture; one off second floor master and queen, and one off third-floor 'tower room'. Infinity-edge pool is 18x40 and is shared with other home we rent. It is not heated. Wonderfully relaxing and enjoyable family time! Beautiful house and grounds. Very helpful and easy to get ahold of property manager! My wife, three young kids and I had the pleasure of staying here the first week of November 2018 and had a great time. Absolutely stunning property and home! Very well appointed, decorated and stocked with everything you could possibly need. Large, roomy and comfortable...extremely well kept and clean. The views are stunning as are the grounds, yard and beach. Everything is nicely taken care of and maintained. Having a small private beach and ocean pretty much all to ourselves was incredible and our kids had a blast. It was nice not having waves or an undertow to worry about and the shallow waters of the bay were perfect for seeing marine life, kayaking and fishing. We didn't catch much fish but enjoyed catching quite a few blue crab. We saw sting rays, puffer fish, dolphins and a huge assortment of fish every day. We also loved having the kayak to use to paddle around in. Great location as it's very close to several grocery stores to pick up anything needed for a stay. Kitchen is well stocked with enough pots, pans, utensils and other items for cooking. The weather cooperated for us and although the pool is a bit cold this time of year, the ocean temps were decent and everyone enjoyed the hot tub too. Elizabeth was a joy to deal with...she was very professional, friendly and just an email/phone call away for anything we needed. She made sure we arrived safely and checked in on us to be sure we were enjoying ourselves. I highly recommend the Palm Breeze Beach House and hope to come back again soon. We had a wonderful family vacation!! One of the best places we have ever stayed!! We have been traveling with a friend group for 15 years. We typically stay ocean front but decided to give the sound a try this year. We so enjoyed the beautiful infinity pool, it was perfect for our group. The men in our group fished from the pier every night and loved that it was located right out our back door. The home was nicely equipped with beach toys, floats, chairs and a kayak. We watched many fish, birds and dolphins during our stay. The home was so clean and spacious.The home furnishings were comfortable and well maintained. The kitchen was fully equipped and organized very efficiently. We really can’t say anything but positive things about this rental. It was a wonderful experience!! The owners were so helpful and accommodating. We will definitely return to this beautiful home in the future. Great Place to vacation with your family. My husband and I rented the house for our 40th anniversary celebration with our children and grandchildren (10 adults, 5 yr old, 3 two yr olds and a 5month old). We had never stayed on the bay or sound side before and it was perfect for all of us and the children. The pool was wonderful, fairly clean given all the traffic and sand that was around. Pool service came twice during the week to vacuum and take care of both the pool and hot tub, which was actually used. Plenty of toys and floats in the garage so no need to bring too many of our own. The kayak was fun for a few trips, mostly in the morning before the wind picked up. The directions on the GPS were accurate and we had plenty of room to park. The door combination worked at 4 and not before, as stated in check-in info. We were lucky with our neighbors as there were no issues with the pool or beach. They may have felt differently, with all of our little ones swimming and such. The house was very spacious. The linens were nice quality as were the mattresses. The house was clean and had sufficient supplies. We had to get more toilet paper and paper towels as well as laundry detergent. There were only 2 dish towels, which for a house that is serving meals 3x/day for 15 people, isn't nearly enough. There was enough cookware to work with for the meals, and plenty of dishes and silverware. We ate in shifts due to the ages of the children, but between the counter and the table, everyone had a seat if they wanted. The door lock on the mail floor was tricky but we needed to lock it at night because of the children and the pool. The balconies were delightful to have morning coffee or evening cocktails on and we thoroughly enjoyed them. Two of the adults had to work online while there and the WiFi worked well. They used the 3rd floor room to get away from the activity but without a door, it wasn't particularly quiet. We meant to play foosball downstairs but never got around to it as outside was so appealing. The parents of the babies brought sound machines for nap times and it worked well. We didn't go out to eat, except once at Clemenza's in Fr Walton, which was great. The Walmart was convenient and we made multiple trips. The guys played golf 3 times and the girls went for mani/pedis for our treat. Sounds like you and your family had a wonderfully active week, and we're thrilled you enjoyed your stay! We'd love to have you come back again! In addition to the pool, spa, and beach on site, we are located only 4 miles from Navarre Beach and 15 miles from the shopping and family attractions of Destin. You can do all of the following nearby: visit the Butterfly House, take a Dolphin Cruise, see the Gulfarium, shark museum, bike along the National Seashore, picnic, parasail, snorkel, kayak, deep sea fishing, canoe or hike trails along the Black River. See the National Naval Air Museum in Pensacola. Golf and miniature golf. You also have convenient access locally to a Walmart, Target, grocery stores as well as local restaurants to suit anyone's taste. We do not rent to student groups or 25 and under. Sorry, we do not allow pets.